Production Line Label Applicators | Marktec Products Inc.
FoxJet’s LS4750 all-electric applicators save energy and reduce costs. The FoxJet LS4750 wipe unit allows for up to 800 products per minute. The color touchscreen display features an intuitive user interface that provides real-time reporting and on-board diagnostics. Applicator module configurations accommodate side, top, bottom, corner wraps and tamp/blow label applications. The FoxJet LS4750 tamp unit allows for quick change of tamp pad for easy changes on the production line. Colamark is a leading solution provider specialized in labeling, card fabrication/process equipment and Ink Jet system integration. Targeting the requirement on pharmaceutical, food and beverage, daily chemical and electronic industries, Colamark offers economic semi-automatic series including semi-automatic flat bottle labeling machine, semi-automatic round bottle labeling machine and semi-automatic tube labeling machine. 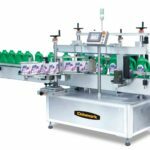 Colamark blister machine consists of tray forming, bottles placing and tray die cutting components, offers total tray packing solution on pharmaceutical vials, oral bottles, syringes, etc. Capacity can be up to 600ppm. Colamark tablet counter is a vision based counting machine, revolutionary from the traditional multiple channel counting method. Its mechanism is brand new and patented, including high speed image capturing, actuate counting, and logical allocation. Colamark designed specifically for pharmaceutical, food, cosmetic and other industries for the design of the entire servo drive speed cartoning machine, vertical cartoning machines, high speed servo cartoning machine, wide scope.